The 2016 Customer LoveFest welcomes AVANZA, Inc. President and COO Ms. Yayu Javier as one of the speakers for this year's event. She is an MBA graduate of the Ateneo de Manila university and has over 20 years of experience in loyalty and customer relationship marketing. She also has exposure in various companies ranging from retail, consumer goods and banking, and is an established expert in loyalty. 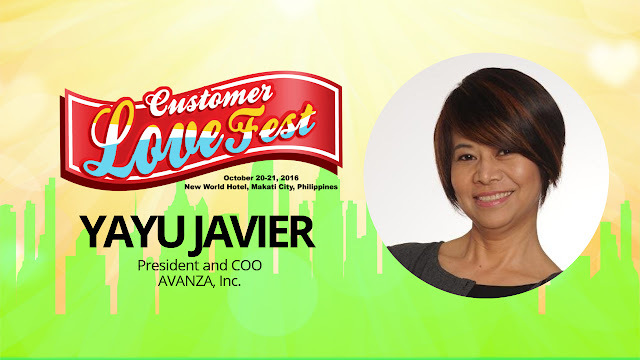 Ms. Javier has been part of the roster of speakers for the Customer LoveFest before, and now she's back to update us with the latest insights on effective loyalty and rewards program practices in the country. See her and other international speakers at the Customer Love Fest happening at the New World Makati Hotel this October 20 and 21, 2016.